On April 25 and 26, the 2nd game of 64th Meijinsen was held between Challenger Tanigawa 9dan and Meijin Moriuchi in Niigata prefecture, Japan. 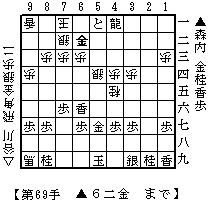 Moriuchi played Sente(black, lower side) and won the game with 69 moves. The score after the game is 2-0 led by Moriuchi.